The precision, passion and patriotism on display at the Tomb of the Unknowns is unparalleled. Rifle-toting Honor Guard members have been keeping watch over the unknown soldiers interred at Arlington National Cemetery every minute of every day since 1937. It’s an honor just to witness these Sentinels, of whom there have been only 640 in history, walk back and forth in front of the tomb in 21-step intervals, meant to represent the 21-gun salute — the military’s highest honor. The changing of the guard, which happens every 30, 60 or 120 minutes depending on season and time of day, is a fascinating ceremony that highlights the intense preparation required for this post. Each member of the Tomb Guard puts in hours of “mirror time” to perfect his or her technique. Merely witnessing these guards is impressive, but sometimes civilians get the chance to stand alongside the Sentinels for a special ceremony. It’s called a wreath-laying ceremony, and it gives members of the public the chance to pay their respects to the unidentified soldiers buried at Arlington National Cemetery. 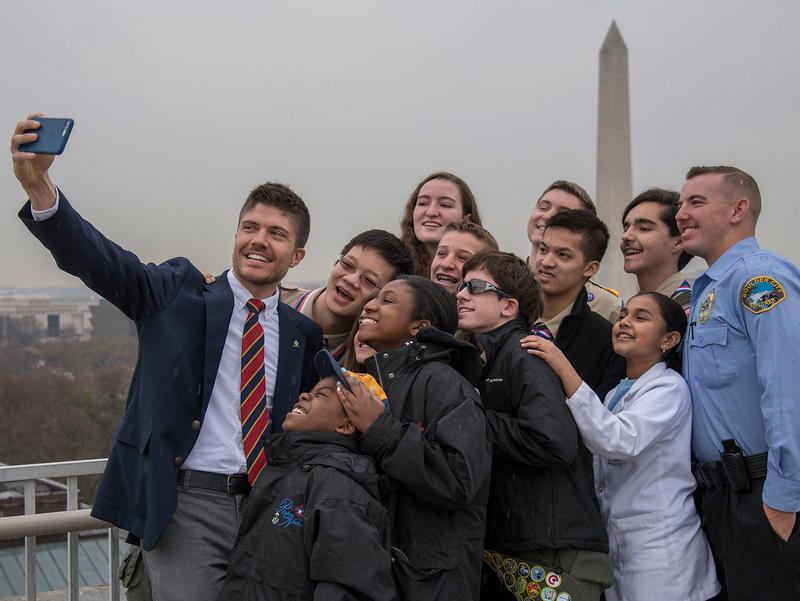 On Monday, two Boy Scouts, one Venturer and an Explorer participated in such a ceremony as part of the 2015 Report to the Nation visit. Watch the video below. Cynthia Garcia, Ian Napoleon, Matt Moniz and Edward Abraham put on white gloves and joined the Sentinels as a special wreath bearing the words “Boy Scouts of America” was placed near the tomb. The Scouts saluted America’s fallen heroes as “Taps” played. Watching it gave me chills, but what’s cool is that any Scout group — not just members of a Report to the Nation delegation — may participate in a wreath-laying ceremony like this one. Requests are accepted six months to a year in advance of the group’s visit, but must be submitted at least 5 weeks in advance. Please note that while dozens of such ceremonies are arranged each week, it is possible that an official event could arise that would take precedence. Have your Scouts participated in a wreath-laying ceremony and/or witnessed the changing of the guard? Tell your story in the comments. Read more coverage from the 2015 Report to the Nation, happening Feb. 27 to March 3, 2016, right here. And see more photos here. Photos by Michael Roytek and Randy Piland.